Hello lovelies!! 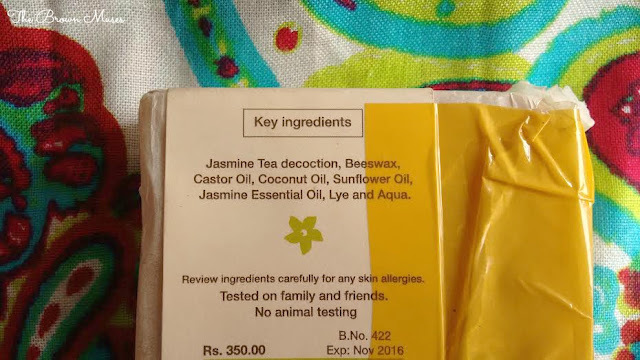 I am back with a review of another handmade soap which I got from Pakistan. As you all know I am a huge fan of handmade and chemical free products and this soap is devoid of harsh chemicals. Today I will be talking about Aura Jasmine Tea Soap. Read on to know to my experience. Shelf Life: The label says November 2016 however the date of manufacturing is missing. Ever since I switched to handmade skincare and bath products my skin's texture has improved tremendously. The soap I am reviewing today contains completely natural and chemical free ingredients which is great to nourish and pamper our skin. Aura Crafts Jasmine Tea Soap comes wrapped in a butter paper with labels mentioning price, ingredients, shelf life etc. The packaging is simple yet classy and I really like it. Since the main ingredient is jasmine tea the soap smells exactly like that. The bar is pale cream in colour and is soft in texture. Since it's a handmade soap it's adviced to cut it into two halves before using to make it last long and suppose if the bar is bigger then cut it into three logs. 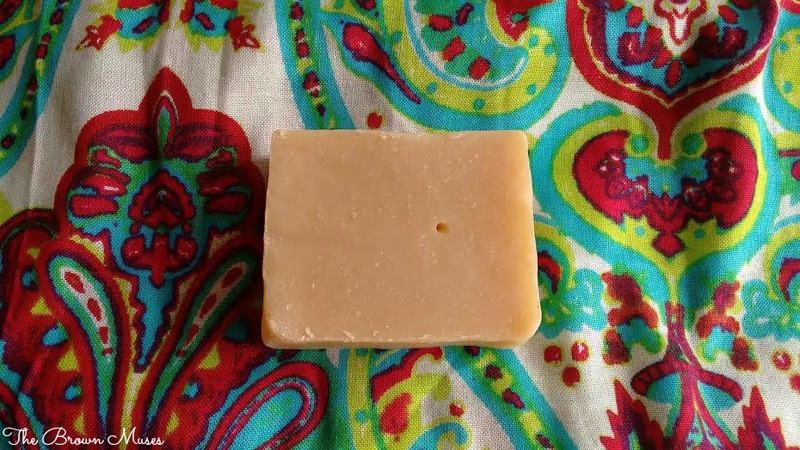 Use one half and store the other half in away from light and air, additionally, it's also adviced to keep the soap dry between uses as handmade soaps tend to melt faster if not dried between uses. I used one half and the other half was used by my mother and made sure we kept the soap dry between uses to make it last long. 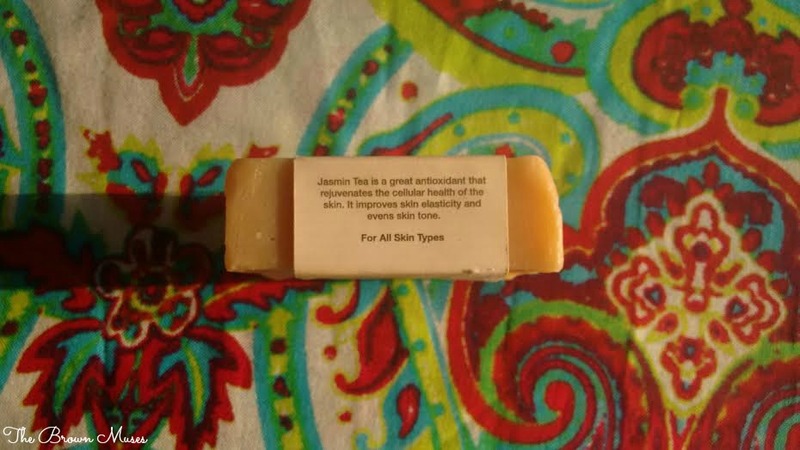 The Jasmine Tea Soap produces mild lather and cleans the skin effectively. I use it once a day to bathe and it has never disappointed me. Above all, the soap doesn't strip my skin off it's natural oils. If you have oily skin you may skip moisturiser but I have dry skin and I do need to follow up with a moisturiser because the soap is not that hydrating for winters however it doesn't make the skin dry as mentioned earlier. I have also noticed that consistent use of the soap makes the skin smooth. The soap doesn't have a strong smell which is good for people with sensitive noses, the fragrance of jasmine doesn't stay put on the skin for too long and I've no complains because the soap does it's job of cleaning the skin very well. 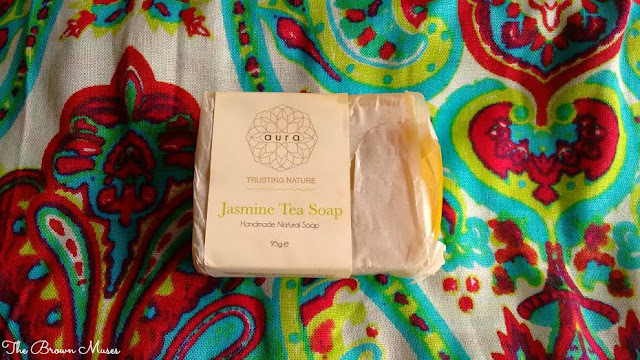 The soap contains goodness of jasmine tea and jasmine oil which are known for their jasmine has been used for centuries to keep the skin soft and protected against the environmental damage caused by changes in weather. In addition, jasmine can also be used to help alleviate skin eruptions and naturally clear away stretch marks, acne scars and wounds. Other than that the soap contains a blend of skin loving oils such as castor, coconut, sunflower oils. To conclude, Aura Jasmine Green Tea soap is a great soap to include in your bath and body care stash! The soap is super mild on the skin and causes no dryness or irritation. However a patch test is highly recommended. Will I recommend: YES! Please use it and your skin will thank you later. Contains no harmful chemicals and cruelty free. Contains goodness of jasmine green tea and jasmine oil. Reasonably priced for a handmade soap. Cleans, nourishes and hydrates the skin. Super mild on the skin. Melts a wee bit faster. Disclosure: This product is a gift from a friend and the views and opinions expressed hereby are strictly unbiased, based on my personal experience.